For many of us, breakfast is the hardest meal of the day. I mean in reality it's probably one of the easiest meals to physically make, but being creative, different, interesting and flavorful isn't something that usually happens. At least for the majority. Let me guess. Your breakfast looks similar almost every morning. 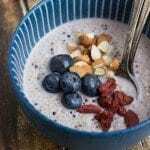 Maybe it's a smoothie, a bowl of oatmeal, a juice or even some eggs and toast; if you don't eat the same thing almost every day, I bet you're rotating through a set three or four. I know that's how it is for me. It's hard to push yourself to come up with something new and different when all you're trying to do is get out the door. Why? Because mornings are stressful and breakfast needs to be fast. You're trying to get your day started as quickly as possible, while still getting something healthy and nutritious to eat, and it yet seems totally unrealistic to get up half an hour early just to make sure you have enough time for a fabulous breakfast. Let's be honest…we all know how important our beauty rest is. And breakfast will almost always take a back seat to an extra 30 minutes of sleep. Which is why I love quinoa. 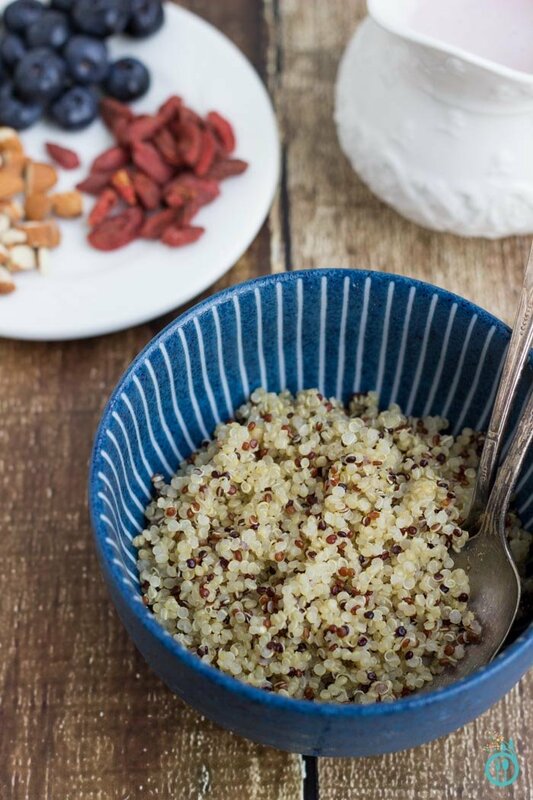 Quinoa is the ultimate breakfast food. It's packed with protein, it's a complex carbohydrate meaning it digests slowly in your system to help keep you feeling fuller for longer, but it also has many hard-to-find nutrients. 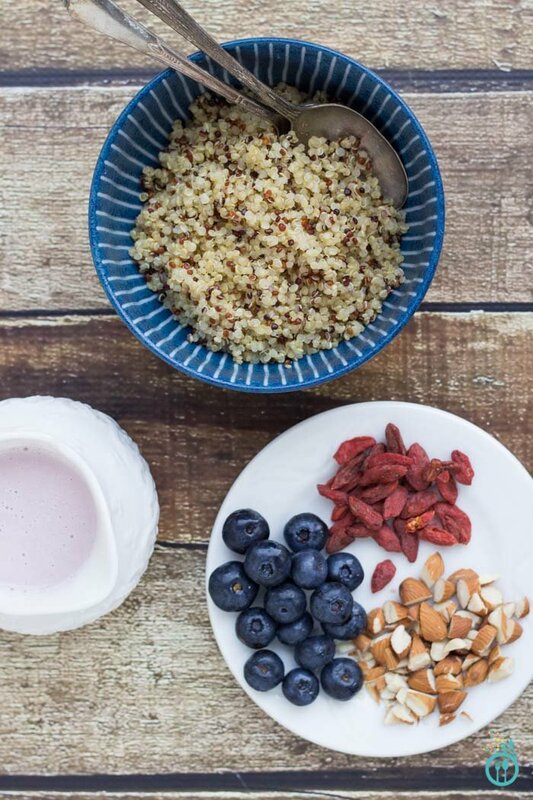 And what makes quinoa so perfect for breakfast is that you can jazz it up for whatever you're in the mood for. Let's take this recipe for example. I made a conscious effort last week to switch up my breakfast routine, so I decided to make a big batch of quinoa on Sunday and use it throughout the week to make something different every day. Some mornings I add it to my smoothie, other times I toss it with some veggies (with the occasional egg on top), but it's been my quinoa breakfast bowl discovery that has made me realize how perfect this little seed truly is. You can serve it hot or cold, with or without toppings, sweetened or unsweetened, spiced or not. It truly affords you the luxury of creativity and variety, without creating a roadblock for your morning. While I plan on sharing many of my latest quinoa breakfast recipes with you, this first one is a little extra special. I feel like I've come up with something legendary here. I've always been a cereal fan. It's what I grew up on and still to this day is one of my all-time favorite comfort foods. It's true; when I came back from studying abroad in Spain, the only thing I wanted to eat (as my first meal back in the United States after 6 months) was a bowl of Honey Bunches of Oats with homemade granola on top. I kid you not. And it was probably the best bowl of cereal I ever ate. But that little tangent is beside the point. The point here is that while breakfast cereal is totally delicious, I've found a way to take it up a notch without doing anything crazy. Instead of using plain milk, I've started making fruit infused milks to eat with my cereal and it's totally rocking my world. Seriously, you're going to love it. 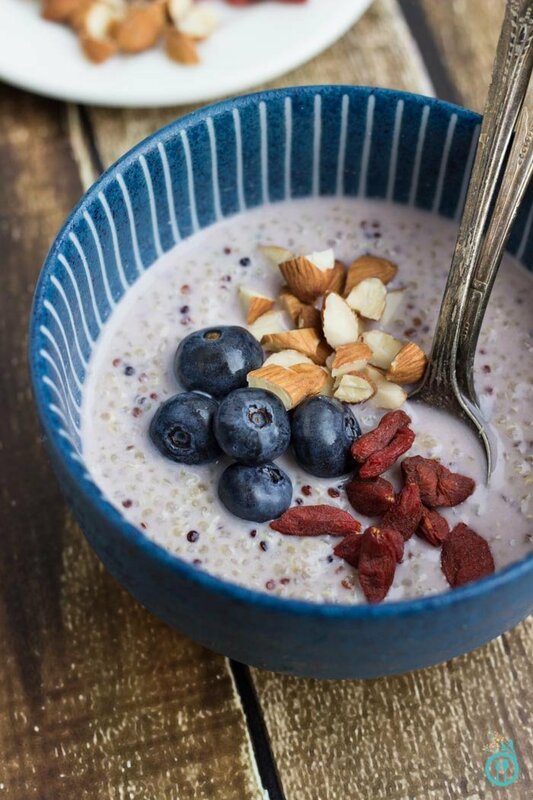 This recipe is for strawberry infused milk, poured over a simple bowl of quinoa, then topped with blueberries, goji berries and almonds. Honestly, the whole breakfast has fewer than 10 ingredients and couldn't be easier to make. Can't wait to hear what you think. And make sure to come back and share your fun quinoa breakfast creations with the rest of us…I'm dying to know what you're waking up with! Add top 4 ingredients into a high-powered blender. Blend on high until smooth and creamy (will be the consistency of milk). Set aside. 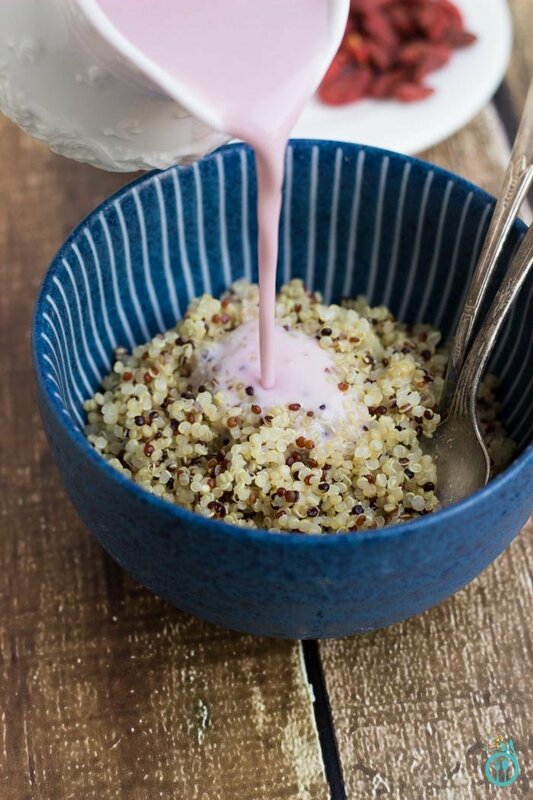 Place quinoa in a bowl, pour milk over and sprinkle on toppings. Trying this today! Yum and so easy! This looks awesome! Does the strawberry “milk” keep well overnight? I live in an apartment with roommates and I don’t like using the blender too early in the morning. Thank you and I can’t wait to try this! Can I substitute the water and cashews for 1 cup of almond milk? Made this today with leftover coconut milk quinoa and was delicious. I heated the quinoa and the milk was cold. Thanks! Would this freeze well? I’m going on a trip and looking to make this ahead, freeze that thaw and serve. Do you have the calories, fats, carbs and proteins for this recipe? Every Sunday evening I make a large bowl of quinoa, with it I mix in raisins (to make it sweeter), cashews, pecans, pine nuts, chia seeds and flaxseed and dish them into 5 different containers. I have a carton of coconut milk at work which I pour into the bowl and then put in the microwave for a minute and a half. Sometimes I add a sliced banana if it is a gym day. It is perfect but I have the same concoction every day! I am looking forward to trying this one out, get some extra flavours in. I also have some small cartons of strawberry coconut milk at home! I haven’t tried quinoa for breakfast but I think you guys convinced me! This looks so light and delicious. I love the idea. This looks so delicious, there is no better way to start the day! Thanks for sharing your beautiful and delicious recipes! Quinoa is my latest fad, thanks for sharing your awesome creations! Not only does strawberry milk sound like it’ll taste great, but I love making my foods odd, bright colors 🙂 Great idea. This is the second time in 2 weeks I have seen quinoa for breakfast. I really really really need to give this a try. LOVE this! Looks delicious Alyssa! And your secret “milk” makes the combinations endless. Love how versatile this recipe is! Wow, so healthy and looks amazing! Thanks for your wonderful blog! I love eating quinoa as a cold cereal. I do have a questions though – where do you find your goji berries? I could only find them in one small local health food store near me and they were over $10 for a very small container of them. I would love to try them, but I can’t imagine doling out that much money for a couple handfuls of dried fruit!! Pro tip (just kidding, I found this out while living abroad in China! ): Check asian grocery stores! Goji berries super cheap there. Hi, how to prepare quinoa and keep it for a week supply? I do make oatmeal and normally can keep for 4 days. Simply make a big batch – maybe 2 cups at a time – and keep it in the fridge. Heat it up as needed 🙂 Enjoy! First off, the strawberry infused cashew milk is just brilliant! This morning I added chia seeds, walnuts, a some gluten free oats and it was delicious! Thanks for the continually awesome ideas!! !